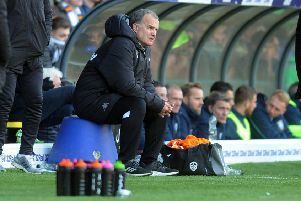 They were denied the win they wanted to open the new season, but Leeds United were talking about a positive start after an encouraging display against a Burnley side that was gracing the Premiership last term. New head coach Uwe Rosler certainly felt his side should have been celebrating three points and it looked like they would be when substitute Mirco Antenucci broke the deadlock seven minutes from time. But a moment’s hesitation in defence was punished when one-time Leeds player Sam Vokes headed home a late equaliser and the Whites had to settle for a 1-1 draw and a moral victory after they had played the better football. Rosler nevertheless remained optimistic that his young side with an average age of only 23 are on the right path for an improved campaign. He said: “It’s a very positive day. “This group of players have set a high standard and that’s now the level I’m looking for. That will make it very interesting in the weeks to come. Rosler thought Leeds had deserved to beat Burnley. He said: “Coming on the back of a season where we finished 15th in the Championship and flirted with relegation, we played against a team who had been in the Premier League and more or less had the same squad of players. “I don’t think you could see any difference whatsoever. In terms of the amount of chances, we should have won the game. “We’ve got one of the youngest squads in our division – maybe the youngest. “We have three or four players who are still learning the game. If I am going to be realistic and fair as a coach, I cannot expect that every little detail is perfect. “We are learning the game and we will make mistakes. The way I see it, our performance was spot on against a top team. Rosler was delighted with the contribution of goal scorer Antenucci off the bench and the player he replaced, Stuart Dallas, who enjoyed an impressive debut and instantly looked like the answer to United’s biggest problem on the left wing before a lack of match fitness caught up with him. He added: “Mirco was very honest early on. He came to me and said ‘gaffer, I’m not really a wide player’. “We tried to find a way to fit him in and in pre-season he came on for 20, 30 or 45 minutes in that scenario. “The way he is training and the way he conducts himself every day is fantastic. I knew when I brought him on that we had a chance of winning the game. “Stuart is a little bit behind schedule – he didn’t get a lot of match minutes when he was at Brentford. “I was thinking of not even starting him, but he’s looked very good in training since he joined us.